DREAMING PLACE is an experimental project by Anna Keleher (Devon) and Claire Coté (New Mexico), prompted by the investigation of dúlra – ecosystem; dúchas– heritage; aisling – dream. 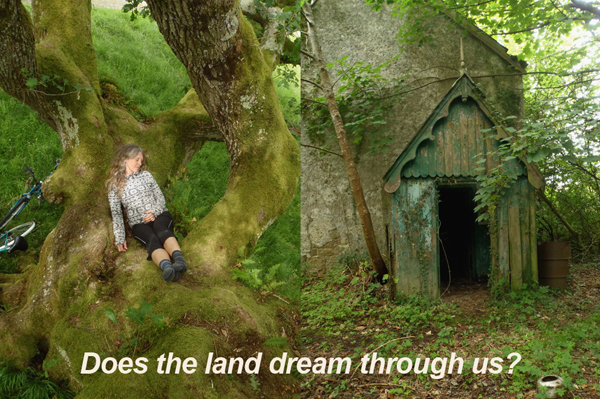 Based on an ancient Celtic tradition in which the land remembers everything, the project explores “dreams of place” and how lands speak through dreamers. The project began with a 40- day, research-driven, traveling residency throughout Marble Arch Caves Global Geopark in June and July, 2011. During their time exploring the Geopark, the artists devised novel techniques for deep immersion in the diverse natural, cultural and dream ecologies of these X-border homelands. From this collection of techniques they created the Place-Dreamer Toolkit. DREAMING PLACE continues to evolve and grow. Since the completion of their fieldwork, Claire and Anna have been diligently interpreting, processing and editing data gathered from Geopark with their Place-Dreamer Toolkit. Because Anna lives in Devon, England and Claire lives in New Mexico in the U.S., they use a suite of internet technologies to keep their international collaboration flourishing across the miles. Outcomes include their DREAMING PLACE archive blog, their Collaborative and Dream Cloud Drawings, the 5-part Radio Dreaming series set for international launch in April 2013 and their new off-grid Place-Dreamer Pod, which will make its debut on the Radio Dreaming Tour of the Geopark in April – May, 2013. Participate in the project through the DREAMING PLACE blog by commenting on posts, or by contacting Claire and Anna directly. If you’d like to hear Radio Dreaming on your community radio station, please request a broadcast! If you live in the Geopark and would like the Place-Dreamer Pod to visit your area, please request a visit!